Space tugs can enable vehicles to switch among Space Elevator tethers all around the Earth. For physical tethers made of CarbonNanoTubes (CNTs), space tugs can push climbers from up-link tethers to down-link tethers. Also, TE proposes beam riders to ride particle beams from Earth's surface to Geosynchronous Equatorial Orbit (GEO); space tugs can assist them in many GEO based maneuvers. Space tugs can push GEO parked habitats to other orbits about Earth. An orbiting habitat can provide many thousands of humans with a friendly environment. However, to transfer between terrestrial orbits, habitats need an external propulsion source; thus, TE's "space tug" concept will come into play. "Space Tug" is a well used, modern day concept. BACKGROUND. A space tug can transfer payloads between orbits. It was first envisioned in the post-World War II era as a support vehicle for a permanent, Earth-orbiting space station. Term "Space Tug" was initially coined by science fiction writer, Murray Leinster, as the title of a 1953 novel . Since then, modern industry have leveraged this concept many times; a few examples are shown below. STS NASA first considered a reusable space tug as part of the Space Transportation System (STS). This was a basic propulsion module which could attach a crew module or other payload . This was never realized due to NASA's budget cuts in the wake of the Apollo program. With propulsion module and a variety of cargo kits, NASA's Space Tug could have fulfilled many space applications. 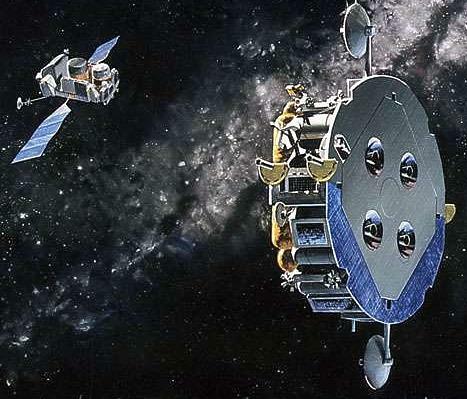 OMV Under NASA contract, TRW designed another space tug, the Orbital Maneuvering Vehicle (OMV), to retrieve satellites, such as Hubble, and bring them to a mother ship. It was also a victim of budget cuts. 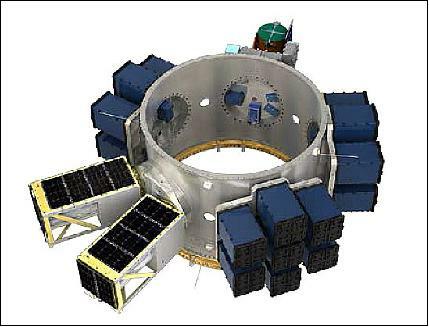 Parom In 2005, a Russian corporation, RKK, proposed a space tug, Parom, to ferry modules to the International Space Station (ISS). Parom is "ferry" in Russian. Sherpa Spaceflight Inc. proposed Sherpa, an orbital tug for SpaceX's Falcon-9 launch vehicle. Plans called for SHERPA to ferry small payloads to secondary orbits away from the main payload's primary orbit. Thought Experiment (TE) proposes a Space Tug which might look something like the one in the diagram. Such a vehicle could use traditional rocket fuel (liquid/solid chemicals), but TE proposes an ion driven propulsion system augmented with simple particle acceleration devices (i.e., cyclotrons). Thus, TE assumes tokamak, known for plasma containment, can store charged particles til needed to enter cyclotrons. Perhaps particle source could be protons from stored H2O (water) molecules. Space Tug could be at times remotely controlled and other times autonomously controlled; thus, it could readily travel in various orbits around the Earth to position for desired tasks. NOTE: Go to The NASA Psyche mission: Journey to a Metal World for an excellent blog on "Electric Thrusters" by Dan Goebel, Spacecraft Chief Engineer on Psyche. TRADITIONAL TETHER CLIMBERS NEED TUGS. Space tug transports climber from Up-Link GEO Node to Down-Link GEO Node. ISEC proposes at least two unidirectional tethers, one for ascent and one for descent (perhaps others as spares). TE proposes an UP-LINK, for ascending from Earth to Up-Link GEO Node, and a DN-LINK, for descent from Down-Link GEO Node back to Earth. To transfer between GEO Nodes, TE proposes Space Tug to push climber vehicle over the 3,300 km between them. ISEC suggests a minimal separation of 500 km between respective anchors on/near Earth's equator on the ocean. If each tether extends straight "up" or outward from Earth's center, this distance (500 km) between the tethers would increase until approximately 3,300 km between respective GEO Nodes. UNFORTUNATELY, taut tethers (even when constructed of super strong Carbon Nano-Tubes (CNTs)) bear some risk of snapping. Instead of traditional physical tether made of Carbon Nano-Tube (CNT) strands for 1,000's of kms, TE proposes a virtual tether using particle beams from Marine Base Stations on the oceans of the Earth. Instead of physical tether climbers which will take days to ascend from the ocean to the GEO; TE proposes beam riders to make same trip in a few hours. Space tug could readily transport Beam Rider in a variety of ways; perhaps the most common way would be to engage Beam Rider to safely decelerate from high speeds attained by particle beam propulsion. Regardless of which method proves best for non-rocket transport of goods and people to the GEO, TE assumes their time in orbit would be best spent constructing Space Habitats, see TE's Habitat chapter. Habitat concept was first described by Dr. Gerard K. O'Neill in his 1976 book, High Frontier. ● Cylindrical shape can simulate Earth gravity by spinning around longitudinal axis. ● Limitless energy from co-located mirrors to reflect sunlight as needed to the habitat. ● Onboard agriculture from "terraforming" with plentiful food, oxygen and recreation. ● Initial water exported from Earth's bountiful oceans, but eventually water will likely come from in-situ resources such as asteroids and comets. NOTE: Definitely not to scale. Like modern ocean liners which dwarf their tugs, TE envisions habitats pushed by much smaller space tugs. Envisioned Tugs would emit exhaust particles to easily attain velocity of one tenth light speed (.1 c). Furthermore, TE envisions typical fuel requirement to be far less than 1% of total stored water for each orbit transition. In associated diagram, Thought Experiment (TE) proposes a "space tug" to gently push habitat from GEO into an elliptical orbit with perigee (q) of GEO and apogee (Q) at an outer circular orbit. Once vehicles reach Q, tug can again push habitat to join the outer circular orbit. SUMMARY: Habitats can park indefinitely in GEO and can provide many valuable services for Mother Earth. However, habitats will become even more useful when they can transition via an elliptical "transfer" orbit to an outer terrestrial orbit and eventually to interplanetary orbits.